The story of my Dilmah began in 1988. I was then a small tea grower with big dreams, I wanted to bring my country’s tea – the finest in the world – garden fresh and ethically produced, direct to tea lovers around the world. I had to compete with giant multinational brands; many said that mine was an impossible dream. But loyal tea drinkers around the world have made my dream a reality. Today, two and a half decades later, my sons Dilhan and Malik have joined me in my mission. My vision is to bring you tea of the highest quality. Tea that is fresh – rich in flavour and natural goodness – and at the same time to give workers and my country a fairer deal. I pledged to make my business a matter of human service. 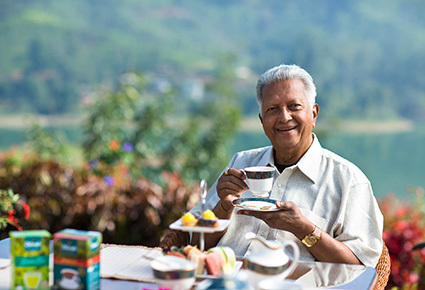 My family tea has grown into an international brand that is enjoyed in over 100 countries. 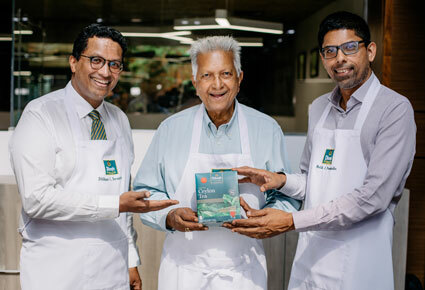 Dilmah owes its success to the quality of Ceylon Tea. Our business was founded therefore on an enduring connection to the land and the communities in which we operate. We have pioneered a comprehensive commitment to minimising our impact on the planet, fostering respect for the environment and ensuring its protection by encouraging a harmonious coexistence of man and nature. The environment is central to Dilmah's business, and Dilmah Conservation was established as an affirmation of this core commitment to environmental sustainability. As Dilmah has grown, I have not forgotten my pledge, and revenue from the sale of Dilmah funds the work of the MJF Charitable Foundation. Our Foundation – I say ‘our’ because every Dilmah tea drinker is a part of the MJF Foundation – has changed the lives of thousands. Its humanitarian service will continue to grow alongside Dilmah. Thank you for so many exceptional years in tea. Please join us in celebrating tea, Nature’s gift of goodness, and in appreciating the special pleasure in a cup of fine tea. Do try it!